When I first came to Japan, I realized that they pronounced names of countries different from the US. For example, in the US we say "Italy" but here they say "Italia". Germany is "Doitsu" meaning Deutsch. Takes some getting used to but definitely good to know. Anyway, recently Hanshin Department store had an Italia Fair (Italian Fair). Last Wednesday, I had some time to spend before meeting Satoshi for dinner, so I went to check it out. They had Italian pottery, cameos, rugs, a huge Italian wine and market area. I came across these chocolates in the market area. Barratti & Milano--I've tried some of their chocolates before. They are from Torino. The guy at the counter was nice enough to give me a sample, so I bought 3 types of chocolates. My favorite was the Pinguino, I liked the contrast of sweet cream and dark chocolate. Just a couple of counters over was Silvio Bessone--This chocolatier was from a town outside of Torino. I got the Marron Glace--a chestnut paste with meringue bottom covered with 70% dark chocolate. And Nej--a dark chocolate mixed with gianduja. Both were good but on the bitter side, I think these might have gone better with red wine or a malt whisky instead of coffee. 210 yen for Nej (about US$2.10) and 315 yen (about US$3.15) for the Marron Glace. The lady in line before me bought 10 Marron Glace and 10 Nej, I was actually kind of embarrassed to buy something after her. After more browsing, I met Satoshi for dinner at E-ma. There is an Italian restaurant that we like called La Botte Piccola. Whenever we eat at Italian restaurants, we always order a salad, pizza and pasta to share. I had a glass of Bellenda Contrada di Conceniqo, a full body red made with cabernet, merlot & marzemino grapes...800 yen (about US$8) a glass. I really liked this wine and hope to find it online or at the gourmet shop. Satoshi had a glass of 2008 Rivera Terra al Monte Sauvignon, a crisp white...700 yen (about US$7). We chose the seasonal salad...endive, baby greens, proscuitto and ricotta...1080 yen (about US$10.80). I loved the light texture of the ricotta. Satoshi chose the seafood pasta...1400 yen (about US$14), this had clams, shrimp, scallops with a garlic butter sauce. I chose the 4-cheese pizza...1400 yen (about US$14). This place always had a nice thin crust, which I love. They used mozzarella, gorgonzola, ricotta and parmesan. A little olive oil and parsley. Really simple yet oh so good! After all those days off, Satoshi was kinda bummed that he had to go back to a full week. After all that feasting the other day...Sunday's dinner was simple...salmon with sweet and spicy rub. To go along with the salmon, I tried Ellie's oven baked onion ring recipe. This recipe was easy to put together. I didn't have baked potato chips, so I didn't put the cooking spray on the rings before baking like the recipe says to do. If you make these, you have to eat them straight out of the oven. They are crisp, delicious and you won't miss that they aren't deep fried. We had this with some leftover spiced mixed nuts, a salad and Monteith's Hearty Black Beer, a smoky, smooth dark beer from New Zealand. 330 mililiters, 5.2% alcohol, 430 yen (about US$4.30). It was a great way to end the weekend. Today is the 4th birthday of this blog...I cannot believe how fast time flies. I cherish the friendships made through this blog. The vast amounts of information learned and shared from blog to blog. Drooling over photos on other blogs, inspires me to take photos just as delicious. 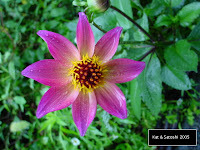 Thank you for reading my blog, it is the first journal I have kept going (for so long). The party started at 13:00 and didn't finish until 18:30...I think the party went well. The dishes I served didn't come out as well as I would have liked. Oh, I forgot to include one more item on the menu...I also served Fragrant Tuna & Chickpeas Salad. There was a lot of laughter, lots of chatter, and lots of alcohol. I think everyone enjoyed themselves. First off, I want to thank everyone who left a message cheering me up over the crappy "no aloha" days I had. I took some of your advice and got into the kitchen. It did help take my mind off of things. Plus, it is that time again, when we invite Satoshi's staff members over for lunch. Most of the items on the menu have been "Satoshi tested"--he's tasted and liked them. I was happy with the sale of shrimp...10 yen (about US$.10) a shrimp...I bought 50 for 500 yen (about US$5), though I am not looking forward to cleaning them. Friday, I made the rafute...since I had some leftover sauce, I poured it over a bowl of rice and had it for lunch (no protein, just sauce and rice)...not the healthiest, but super comforting food. Hope everyone coming over enjoys themselves and has enough to eat. Sometimes daily episodes make me homesick. I like to call them "no aloha" episodes. Whenever I run into "no aloha" episodes here, it makes me crave "the little stuffs" of home...the smiles from people you don't know, gestures of courtesy like holding the door open for the person behind you, saying "thank you" or "excuse me". Take for example the other day, I was in a bookstore, looking at a shelf of books. Mind you, I wasn't right up with my face to the shelf, I think I had some space (maybe a foot, maybe more) between me and the shelf. Along comes a woman, she is looking at the books on the same shelf but further down, she moves closer to me and stops right in front of me! Like I was invisible! WT! I tsked and moved to the side of her but she didn't look at me. Talk about being unconscious to the world around her. And then a few minutes later a guy does the same thing! Unreal! It is Friday here...let's hope next week will be better. Starbucks' short creme brulee macchiato (410 yen about US$4.10) and almond brownie (240 yen about US$2.40). The creme brulee macchiato is similar to the caramel macchiato except they use a darker, slightly bitter caramel on top. The brownie is moist and there are lots of almonds on top...while these two items are delicious, they are not good together (sugar rush!). The other day, I needed some rice for some leftovers I planned to have for lunch, so I stopped into Lawson (a convenience store), to pick up a musubi (rice ball). I picked up this musubi...hele katsu (pork filet cutlet), normally 139 yen (about US$1.39)....everything was 100 yen (about US$1). A nice sized piece of pork filet, fried then doused with a sweet-salty tonkatsu (pork cutlet) sauce. When I first came to Japan and saw "hele" (hay-lay) in Japanese (katakana) I was like WT? It isn't a word we learned in school. When I looked it up I realized it meant "filet". Apparently the Kanto area (East Japan) calls it "hire" (he-lay) and the Kansai area calls it "hele" (hay-lay), both meaning "filet". This musubi could definitely be a meal in itself. Sunday we spent the morning at church for their Autumn service. It was basically the same service as the one during Obon except this time they had chairs for everyone to sit on. After the service, Satoshi, my MIL and I went to Uji. It is about 40 minutes from the Higashiyama area by train. I have visited Uji with my Aunty Merle and with Satoshi during various times of the year. 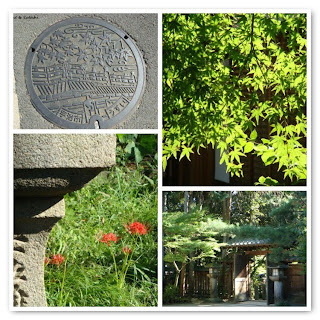 This was the first time to visit the Tale of Genji Museum. This museum showcases "The Tale of Genji" and the culture of the Heian period in Japan. Anyway, my MIL had been wanting to visit this museum for some time now. Last year was the 1000 year anniversary of the tale being written by Murasaki Shikibu. Most of the displays were in Japanese, so I couldn't understand most of them, but did find the display on incense intriguing. The display had different items like clove, sandalwood and other items which were combined to make different fragrances for incense. After walking around the museum and the Ujigami Shrine (the shrine is a UNESCO world heritage), we walked across the river to the Uji shopping arcade. My MIL was interested in checking out the sweets at Nakamura-Tokichi, a famous green tea shop in Uji. We found the shop and a VERY L-O-N-G line waiting to get into the cafe. 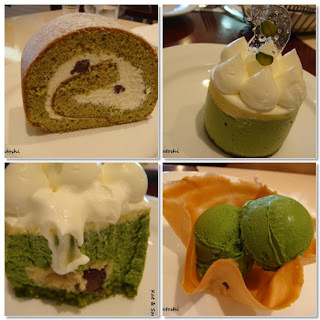 Instead of waiting for a table, we went across the street to Yamakawa, a patisserie. This tiny patisserie also had a cafe, so we signed our name to their waiting list and after about 15 minutes, had a table. If you are going to eat anything in Uji, get something made from green tea because Uji is known for their matcha (powdered green tea). Satoshi got their sencha (roasted green tea) roll. My MIL got the matcha ice cream and a slice of baked cheesecake (she found the ice cream too strong and made Satoshi eat most of the ice cream). I got their matcha vanilla (matcha cake with matcha mousse, a layer of vanilla mousse and adzuki bean and a layer of vanilla whipped cream). This dessert was really light, and the sweetness of the vanilla layers balanced out the bitter matcha layers. It was a beautiful day and we were glad to get my MIL out of the house. Well, to be specific, the lady working at Muji. Awhile back, I went in to buy a replacement ink cartridge for my ball point pen. I found one but didn't know if it would fit the particular Muji pen I had. I saw the same pen in the store and brought the pen and the replacement ink cartridge to her and asked her, "will this cartridge fit in this pen?" She replied quite smugly, "if it is a Muji pen, it will fit". So, I bought the ink cartridge and went home. Well, as I tried changing the cartridge, I realized that no, it did not fit the pen. In fact, it was L-O-N-G-E-R than the pen...Since I had opened the package, I figured that I probably couldn't return it, so with some extra strength tape, I am making do with it. Lesson learned...next time bring the empty ink cartridge. Muji's foldable beds. We had been looking for a box mattress or bed for awhile now, but with our limited space, something foldable is the most practical for us. The foldable bed by another company, that I originally had my eye on, had wheels, could fold up easily and you could lift up your head and feet with a remote. When Satoshi saw it, he said it reminded him of hospital beds, so, that was out. Then I saw these beds at Muji. When not in use, you can fold them up into a sofa. Each one is about the size of a love seat. It can fold out flat to sleep or prop up your legs and back, kind of like those lounge chairs at the hotel pool. When we first got them, we sat with our feet propped up, I read and Satoshi watched tv. It was kind of a resort-like mood, then Satoshi says to me, "where's the remote to move our feet up and down?"...sigh. Durance's home fragrance reed difuser, this is a French company which makes soaps and other items. I bought white tea--a musky, yet clean fragrance. Daiei's chinese bento. I've written about this before, and the price apparently went down on Thursdays. It used to be 320 yen (about US$3.20), and is now 299 yen (about US$2.99). On this particular Thursday, I chose stir fried egg and chive, mabo eggplant & sweet sour chicken. I have also been liking Daiei's Thursday sales...most veggies are 100 yen (about US$1) or less! I find I look forward to Thursday's grocery shopping. Nissin's mini-chicken ramen...these are perfect for a lunch side dish---like along side a sandwich. Put one into your mug/cup and fill with water...steep for 2 minutes and eat. I like my noodles on the harder side, so I usually steep for less than a minute. And lastly, the sunsets...have been really orangey and beautiful. When I see them lighting up our other room, it has a warm and fuzzy glow. Sorry for so many muffins this week, I had some butter that I wanted to use up. Anyway, before we went to Palau, I also had some lemons that needed using, since I knew I wouldn't get around to using them before we left, I zested, squeezed and froze them. Add the lemon juice, zest, nibs and chocolate to the the sifted dry ingredients and add to the egg mixture. Fill 6 muffin papers as evenly as possible. NOTES: The original lemon muffin recipe says "juice of one lemon". I didn't know if I should add the lemon juice plus the full amount of milk in the basic recipe or even out the liquid to match the amount of liquid in the basic muffin recipe. In the end, I decided to even out the liquid, for fear of having too much liquid in the batter. These were puckery. The chocolate I used was 60%. I think if I used a chocolate closer to milk chocolate, it may have balanced things out. Still, I liked these---really moist, chocolatey and very lemony. It is Friday...Saturday starts a 5-day weekend here...hope you have a good weekend! The weather has been getting cooler. Some days are beautiful and sunny while others are kind of gloomy and rainy. I think Autumn is almost here. At the market, they have started bringing in the chestnuts and pears. Not sure why I was craving tandoori chicken, but I was. The last time I made this, there was a slight "problem" in the kitchen. This time around everything went okay, except that my lack of counter space made for balancing things here and there. The market had an awesome sale on chicken, 48 yen for 100 grams, so I only paid 172 yen (about US$1.72) for 358 grams. Then at about 15:00 (snack time), I flipped them over in the marinade. Previously, the pieces I had were smaller with no skin, so I cooked them for only 10 minutes then under the broiler for 17. Since the pieces I had this time had the skin on them and were thicker, I put them into a 350F (180C) oven (skin side up) for 30 minutes then under the broiler for about 5 minutes. The skin came out so crisp (of course I had to eat the one I had for dinner! ), the meat was very moist. I also made some carrot salad and couscous with dried fig, cranberries, apricots and nuts (pine nuts, pecan & cashew). I also roasted some red bell pepper and onion. Since I had some cucumber to use up, I cut it up and added it to the plate. Not the most aesthetic plate, overall it was kind of labor intensive, it was a tasty dinner, which made it all worth it, plus we have leftovers so I don't have to cook tomorrow. I saw this recipe on La Fuji Mama and had to try it...well, I used her idea but turned it into muffins instead of cake. I thought, instead of making a whole cake, making 6 muffins would be somewhat "figure friendly". So, I went to a basic muffin recipe that I normally use and added chocolate chips, cocoa powder, zucchini & some cacao nibs. The results was a fairly moist muffin. Sift the baking powder, flour and cocoa, set aside. Add the zucchini, nibs and chocolate to the the sifted dry ingredients and add to the egg mixture. NOTES: Maybe I should have added more zucchini because you can't taste the zucchini at all. (Or maybe you aren't supposed to be able to taste it?) It is a great way to get your veggies in and it makes a perfect snack or breakfast on the run. I would definitely make this again. I'm in love with these little cookies...I recently came across these at Sony Plaza, they are 100% vrai, which means 100% pure in French. If you look at the back of the box, they only use "real" ingredients, no additives nor preservatives. Michel et Augustin is a French company run by two friends, making sweet and savory cookies, yogurt and other items. I think all their products are pure with no additives nor preservatives. In each box, 6 cookies are divided into two packages of 3. Since Sony Plaza had 4 flavors, I bought one of each to try. Vanilla poppy seed--were a little stale but I have a feeling it is because there are no preservatives. Orange flower water--were nice, the orange flavor "blooms" in your mouth. Caramel--didn't really have a caramel flavor but reminded me more of brown sugar. Chocolate chip--didn't jump out at me and were just okay. Out of all 4 flavors, I think I would pick orange flower water as my favorite. On their site, they have more flavors, I hope Sony Plaza brings more in. At 315 yen (about US$3.15) for a box of 6, they are a little pricey, but for no preservatives or additives, I think they are worth it. The other night I wanted to make something easy for dinner. I had looked online for a roasted stuffed bell pepper recipe, but most were kinda time consuming (roasting the peppers then stuffing them, then putting them back under the broiler). So instead, I threw several ingredients together raw, stuffed some red bell peppers and roasted them in a 350F (180C) oven for about 40 minutes. Of course when I threw things together, I came out with more filling than needed. So, I cooked the rest of the filling on the stove and served it on the side of the roasted peppers. Bake at 350F (180C) for about 40 minutes. I also had forgotten to add the asparagus I had, so I chopped it up, cooked it on the stove and added it to the remaining filling. Be careful when you cut the roasted bell peppers open to eat, all the juices from the chicken, and veggies will gush out. It was delicious, simply seasoned--lots of veggies, some rice, some chicken and not too much work. Disliking...the new drink by Sekai no Kitchen...Maple and spices, sounded good...kinda tastes like chai but with a sickly sweet maple syrup flavor. This bag by Elise Tran. My Aunty Marian had bought this bag for herself but after using it on a trip, didn't like it, so she gave it to me as an early Christmas present. Starbucks Milano Espresso...hints of chocolate...mmm! On the go, when I can't get a hot cup of coffee, I like this type of coffee drink instead of the canned coffees because the canned ones taste like...cans! Plus, the canned ones have tons of sugar in them. It is cold, but at least I can get a shot of caffeine without all the sugar. Duchy Originals Organic Orange Biscuits...this cookie is delicious with bits of candied orange peel in it. Also they use organic wheat flour, and if I remember correctly a portion of sales goes to a charity in England. Vanilla ice cream topped with a layer of sweet potato and walnuts. The sweet potato layer is a bit gritty/grainy, but overall a delicious combination. Cleaning out the pantry, I found a really (really) old box of Jell-O....used it up with some canned mandarin oranges for a quick and easy dessert. These tiny cups hold 3/4 cups of liquid, but were the perfect size for these desserts. I was able to make 4. Kinda half liking and disliking this one...worms in the lettuce. Diva Chocolate's Mocha Java Rub...after putting the rub on, the instructions suggest putting the protein into the refridge to meld for 30 minutes. The meat was so tender, not sure if it was the grade of meat (black wagyu) or the spice combination in the rub or both. This rub had some cinnamon as well as chocolate, it smells sweet when cooking but isn't when you eat it. Leftovers....now, I rarely say that I like leftovers, but a sandwich made from leftover steak, some mayo, leftover pistachio baguette and leftover veggie sticks made a great quick lunch. My new 27 cm (10 inch) violet T-fal pan, 1468 yen (about US$14.68). I was recently looking for a new pan and wanted something "made in Japan", but almost everything Seiyu had was "made in China". Luckily, I found this T-fal (made in France) on sale, another good thing about this store is that if you bring your own bag they knock off 2 yen, not much, but it is something. The skies indicating that the season is changing and Autumn is coming....love it! Is there something you are liking or disliking?